This recipe features a few ingredients with which most people are not terribly familiar. But rest assured, they are all pretty accessible and they each add something unique to the mix. First off, there is purslane, a green that I hadn’t come across myself until a few years ago when I started seeing it in my CSA pick ups. It’s a peppery, lemony, crisp addition to any summer salad. And it just happens to be a weed! I found this great article on purslane in the Chicago tribune. That’s where I learned that purslane is packed with Omega-3’s, making it a real nutritional powerhouse that gives you one more delicious way to “green-up” your diet. Also on the little known list is sumac. Every time I mention this spice people assume I’m talking about poison sumac. The truth of the matter is that ground sumac is a zingy, lemon-flavored spice used most often in Middle Eastern cooking. It’s beautiful in salads, on dips, and on meat and fish. I get mine at the fine food market at Grand Central terminal in New York City but you can also order it online or purchase it from Middle Eastern food stores. Lastly, there’s haloumi. It’s most closely associated with Cyprus but versions of it can be found around the Mediterranean. It’s a semi-hard cheese that is brined and usually made from goat or sheep’s milk. Be aware that it’s quite salty. Best to salt your salad after adding the haloumi. I pan-fry it very quickly before adding it to the salad. That way the cheese develops a lovely light brown crust that provides a crunchy contrast to the creamy middle. To make the chickpea and purslane salad: Soak the chickpeas overnight then cook according to the package directions. Let cool to room temperature. Add the purslane, mint, and green onion and stir gently to combine. In a measuring jug, whisk together the lemon juice, oil, and sumac until well combined. Add to the chickpea mixture and toss gently to coat. Let sit at room temperature for at least 3o minutes to allow the flavors to blend. Just before serving, slice the haloumi into 1/2-inch thick slices and pat dry with a paper towel. Grease a large frying pan with spray oil and heat to medium-high heat. Add the haloumi in two batches and cook on each side about 20 seconds, until lightly browned on the outside but not melting. Remove from the pan and chop into small squares. Add to the chickpea salad and serve. To make the sumac-scented lamb: Coat each lamb chop on both sides with sumac, salt, and pepper. Grill or pan-fry in a lightly oiled frying pan until medium-rare, about 1 minute per side depending on thickness. Serve with the chickpea and purslane salad. 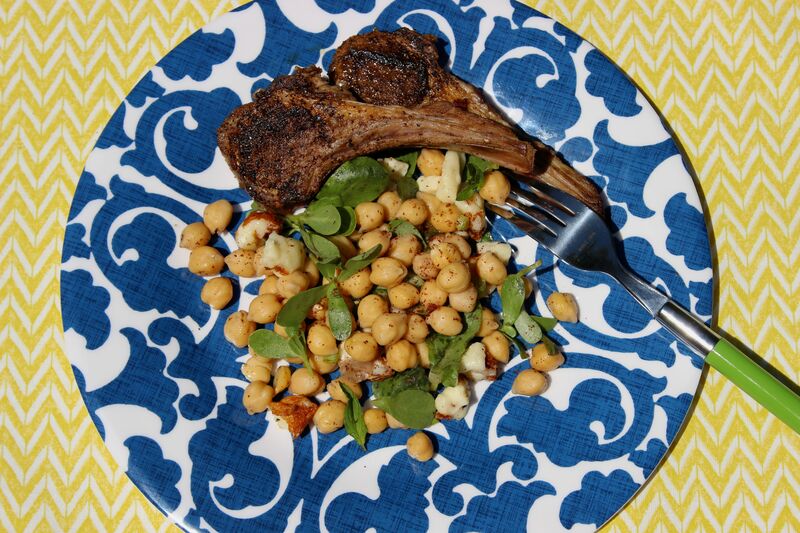 This entry was posted in main, salad and tagged chickpeas, lamb, purslane, sumac. Bookmark the permalink. Haloumi – new to me. Where do you buy it? Hi Barbara! you can buy haloumi at good old C-Town. They have an amazing array of Middle Eastern foods. You can also find it at Whole Foods.